November we want to know about YOU our Helmar Fans! We are excited to ring in November with another great Sketch from Helmar Designer Lydell Quin to inspire YOU!! For more examples go to Helmar's blog ~you have the rest of the month to do the sketch and load it up to the Helmar blog. One lucky winner will get some Helmar goodies. Tomorrow I will be over on ScrapStreet's Blog and over on The Paper Bakery's Blog~would love for you to stop by and say hi!!! This weeks sketch is up on The Paper Bakery's Blog. Grace did a fantastic job!! You have two weeks to do the sketch and load it up to the blog. **Make a page based on the sketch above. Be Creative! **Challenge participants are not required to utilize Paper Bakery kits, but it is encouraged. I saved both sketches to work on this weekend. Your take on it is fab. I love what you did with the banner. Very cool. Oh wow Connie! I totally love that sketch and your creation is simply amazing! so much detail and fun to look at! GREAT work! I love the layout too - going to have to print out the sketch and give it a try!! Great sketches! That Helmar sketch especially, has me motivated. LOVE it!!!!! Love that layout too! I love your take on the sketch...a fantastic layout with great detail. wow! your page is AMAZING!!! Love it...totally stunning! You totally rock the sketches. Awesome! Helmar and FabScraps and December news!!! 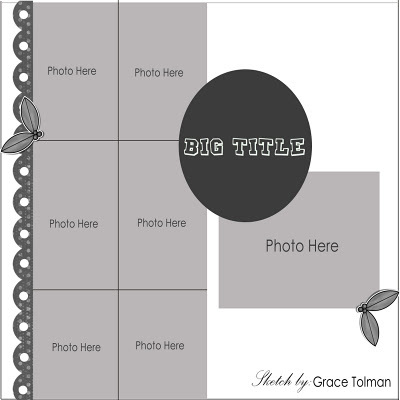 Try It Tuesday~a journal and a sneak look!!! The Paper Bakery ~ sneaks are up!